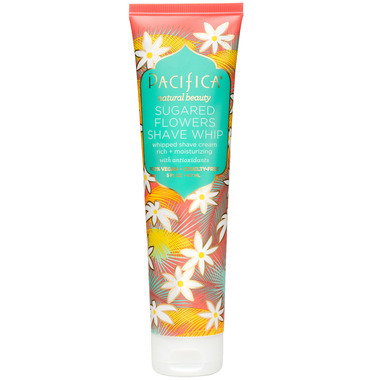 Pacifica's rich cream shave whips give you a super close, moisturizing shave and prevent razor drag. They smell amazing and are fortified with natural extracts that love up your skin and help protect against irritation from ingrown hairs and razor bumps. For all skin types. 100% vegan and cruelty-free. Ingredients: aqua (purified), potassium stearate, glycerin, stearyl alcohol, cetearyl olivate, aloe barbadensis (aloe vera) leaf juice, cocos nucifera (coconut) water, arnica montana (arnica) flower extract, betula alba bark (white birch) extract, brassica oleracea acephala leaf (kale) extract, mixed tocopherols (vitamin E), phenoxyethanol, ethylhexylglycerin, parfum (all natural). 100% love this item. I have tired hundreds of saving creams and they do not compart to this one. I'm so happy I have found a vegan saving cream that smells amazing. It leaves my skin with zero irritation, smelling amazing and lots of hydration. Love this! It smells great, doesn't clog the razor, and allows for a super easy, close shave with no irritation. I was concerned how long it'll last when I saw the bottle though, 'cause it seems quite small, but you really don't need to use much each time, so it'll last awhile. I'll definitely repurchase it. I wasn't sure whether or not to expect lather - doesn't lather very much, but left my skin feeling nourished, and smelled AMAZING.